Connecticut’s 84th governor, William Atchison O’Neill, was born in Hartford on August 11, 1930. He grew up in East Hampton and attended the town’s public schools before taking classes at New Britain Teacher’s College (now Central Connecticut State University). Upon deciding his career interests no longer included teaching, O’Neill went to work for Pratt & Whitney Aircraft and sold life insurance for Prudential. He then joined the United States Air Force, serving as a combat pilot during the Korean War. His political career began when he returned home from the war and went to work at his father’s tavern. O’Neill’s Taproom was a popular spot for local politicians to gather and discuss the issues of the day, and O’Neill, a Democrat, rapidly immersed himself in political culture. He joined the East Hampton town committee in 1954 and, after two unsuccessful attempts, won election to the State House of Representatives in 1966. He went on to win re-election five times, eventually becoming House majority leader in 1975. 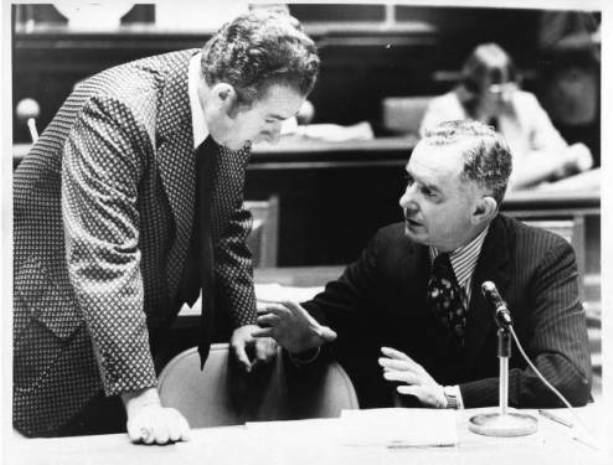 In 1978, with incumbent governor Ella Grasso running for a second term, the state’s democratic party convention chose O’Neill to be her lieutenant governor. Two years after winning re-election, however, Grasso resigned due to her failing health, and O’Neill finished out her term as governor. O’Neill won two re-election campaigns during the 1980s, ultimately providing him with a term of 10 years as Connecticut’s governor. Among his accomplishments while in office was the passing of a 10-year, $5.5-billion plan to upgrade Connecticut’s roads and bridges, and his turning of the $22-million deficit he inherited in 1980 into a budget surplus in just 5 years. He also oversaw the passing of the Educational Enhancement Act, which raised both teacher salaries and educational standards in the state. After leaving office, O’Neill returned to his home in East Hampton, near Lake Pocotopaug. He passed away on November 24, 2007, receiving a burial with military honors in the State of Connecticut Veterans’ Cemetery in Middletown. His legacy is fostered by Central Connecticut State University, where an endowed chair in Public Policy and Practical Politics and a public service scholarship are named in his honor. “William A. O’Neill.” National Governors Association, 2016. Link. “Finding Aid to the William A. O’Neill Papers VHP2005/12.” Connecticut State University, Veterans History Project, 2016. Link. “William A. O’Neill: An Inventory of His Gubernatorial Records at the Connecticut State Archives.” Connecticut State Library, 2013. Link. “Governor William A. O’Neill: William A. O’Neill Oral Histories.” Central Connecticut State University, Center for Public Policy and Social Research, 2000. Link.